Amongst the four Flos species that are extant in Singapore, this species, the Plain Plushblue is the most widespread and often encountered. It is moderately common and can be found in the forested reserves as well as in urban parks and gardens. 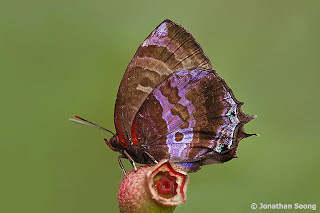 The underside of the Plain Plushblue is purple brown with the usual cryptic markings. There is a small deep red patch at the base of the wings.The hindwing bears a white-tipped tail at vein two of the hindwing and is toothed at veins 1b and 3. This individual was photographed by young ButterflyCircle member Jonathan Soong on Labour Day. The butterfly was one of many that were out and about feeding on the ripened fruits of the Singapore Rhododendron. The photo shows the Plain Plushblue resting on the fruit capsule of the plant in between feeds.